We’ve had some troubles at the farm from our old “friends” the coyotes this season. 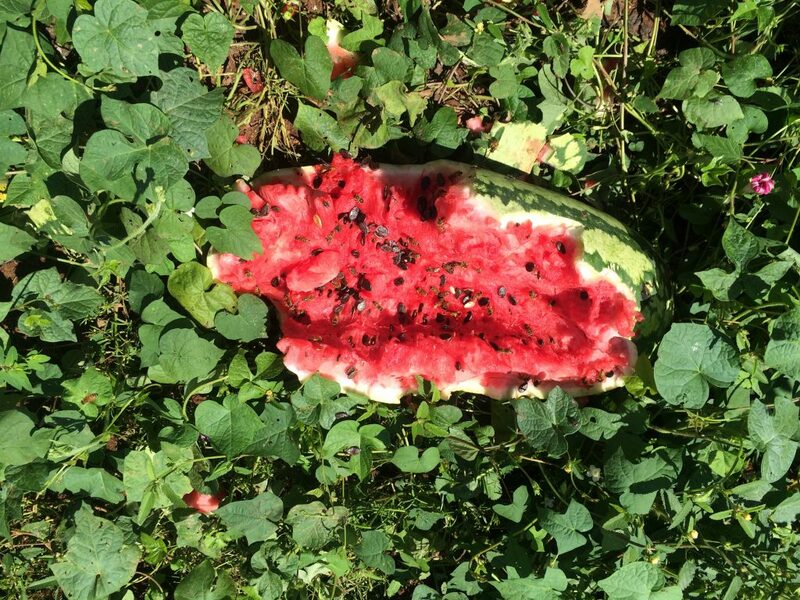 As you can see, even the coyotes can’t get enough of our delicious produce, leaving a trail of half-eaten watermelons, pumpkins and other vegetables in their wake. Heck, even the deer have gotten in on the action, eating up some of our corn. Even though we love animals, they certainly can be a hassle and damaging to your crops or garden. Now, while it may be hard for us to protect everything we grow on our great big farm, it got us thinking about some tips and tricks you can use for yourself at home to protect your garden from your neighborhood critters. We know the season for gardening is winding down, but think of this as tips for next year! All of these tips are easy to do and, most importantly, will not cause the animals any harm. While they can be a nuisance, they are simply acting within their nature and don’t deserve to be harmed. Garden pests are usually pretty wary of humans and will be apprehensive to come and destroy your plants if they think you are always around. Surround your garden with scents they may associate with you to keep them away. Cheap perfume or cologne, coffee grounds, dryer sheets and bars of soap have proven to be very useful, household products used in repelling critters. This is without a doubt one of the best preventatives for keeping away creepy crawlies and critters. Essentially large planters, they can be built with wood, stone or brick to give your garden a stylish look in addition to providing protection. Raised beds with sides at least 18 inches tall will generally do the trick as bugs, rabbits and gophers have trouble getting over the steep sides. We found a great step-by-step guide to building your own, as they can be kind of tricky. Fences provide a level of protection that raised garden beds cannot. While they are good for keeping away smaller creatures, deer and other larger animals will not be inconvenienced in the slightest. Putting up a fence around you garden will give you that extra level of protection. Just be sure the gaps in the fence are not big enough to let smaller creatures in. Another tip: gophers and rabbits love to dig, and can go straight under fences. When you put yours in, make sure to bury it a ways down into the earth to keep them out. Rabbits dislike marigolds, daisies, poppies, purple cone flowers, azalea, boxwood, lamb’s ear, peony and lupine. Deer dislike daisies, poppies, purple cone flowers, lupine, bleeding hearts, daffodils, hyssop and mullein. Alliums, chrysanthemums, nasturtiums and petunias all repel beetles, flies and other bugs. Stay tuned in on all the happenings over at our Open Spigot Farm page!